Pops with hot air, not oil, for a healthy, low-calorie treat. 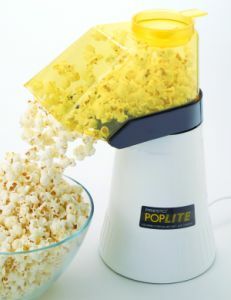 This popper offers a faster, healthier, and more economical choice than microwave bag popcorn. Use regular or gourmet popcorn with terrific results - virtually no unpopped kernels. Up to 18 cups of gourmet popcorn are popped in less than 2 1/2 minutes, up to 40 percent faster than other leading hot air poppers.